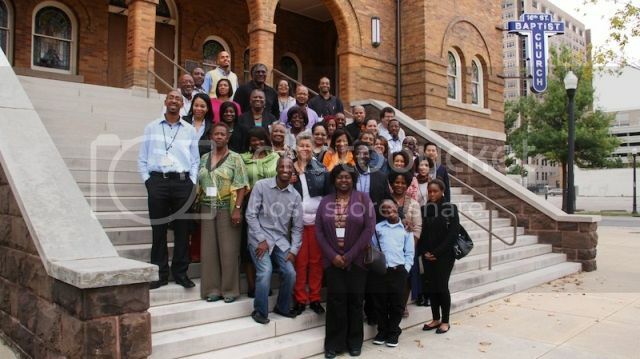 Giving circle members from the Community Investment Network on the steps of the historic 16th Street Baptist Church in Birmingham, Alabama. This week the Black Philanthropy Month 2013 campaign is spotlighting Community Investment Network—its community of donors and giving circles and its upcoming national conference in Denver, Colorado. Community Investment Network (CIN), formed in 2003 by Darryl Lester, is a 501(c)(3) nonprofit organization that invests in the development of Black and multiracial giving circles and donors. CIN empowers its members to give their time, talent, treasure and testimonials to be the change they wish to see. CIN promotes community-led philanthropy and over the past decade has emerged a leading national resource in connecting philanthropic institutions and diverse, everyday givers. Here’s how you can support and advance CIN’s values around collective influence, social justice and inclusive philanthropy. Beyond the Mountaintop is the theme of the 2013 national conference of Community Investment Network. The conference is held annually during the first weekend of October as a gathering of everyday philanthropists and giving circle members. Denver, the Mile High City, plays host this year and this gathering marks the first CIN conference in the West. Contact staff members Chad Jones and Tony Pigford at info@thecommunityinvestment.org with your questions and ideas about giving circles. This is a powerful video from a CIN gathering with the voices and stories of giving circle members from across the country. Share news of your giving circle and its members, grantmaking, civic engagement and impact via social media and blogposts, using the #BPM2013 hashtag. And join us tomorrow, August 13th at 2pm EST for our weekly Tuesday Tweet-up. The topic is giving circles! We will help spread the word to expand your connections!